Max DVD Burner make your burning Video CD,Video DVD,Music CD,Data CD/DVD works more easer and clear! Excellent performance! like a small genius.With the most widely used optical burning software in the industry and the most powerful burning engine in history. Max DVD Burner combines outstanding technical functions with ease of use to enable you to create high quality digital media files. Max DVD Burner provides all the performance and efficiency of Max DVD Burner ROM, but with a user interface that maximizes usability. 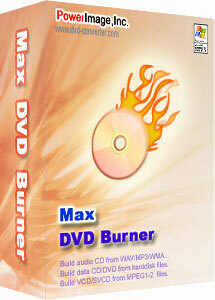 Max DVD Burner is definitive burning software program. Industry-approved, and trusted, Max DVD Burner lets you burn digital data, music, and videos files to CD or DVD in the highest professional standards! Max DVD Burner is the most powerful burning engine in history and has maximized ease of use, efficiency, and speed to let you burn professional-quality CDs and DVDs. Take a deep look about your burn device and the disc in it. Blank a CD-RW or DVD RW disc. Copy CD tracks to wav and save to your computer hard disk. Burn an ISO file on your computer to CD disc or DVD disc. Build on ISO image file from your computer hard disk files for later burn or use. Copy the content of a CD/DVD disc into an ISO file and save to your computer hard disc. Build a music CD from wav/wma/mp3 files and burn to CD disc. Build a data CD/DVD and burn to disc. Build a VCD/SVCD from MPEG1/2 file and burn to disc,or direct burn DVD on your hard disc to DVD disc.